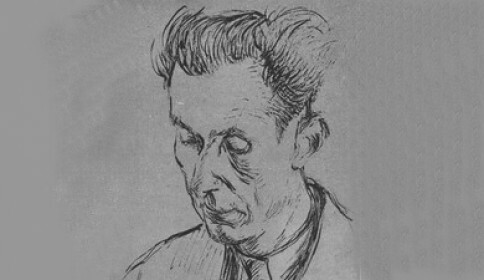 Vjekoslav Kaleb (1905-1996) was a Croatian short story writer and novelist. He has published 57 short stories and three novels, most of which deal with existential struggles of people in the remote hamlets of the rural Zagora during wartimes. In addition to writing screenplays, articles and reviews, Kaleb was also a translator, his most notable work being the translation of Carlo Collodi’s Pinocchio. Kaleb’s works have also been translated into Albanian, English, French, German, Italian, Czech, Polish, Russian, Slovene and Macedonian. The woman listens: the heavy footfalls weigh on the floor boards, they approach the partition, then move away, go out into the hall, towards the front door of the flat, stop, wait, wait, return and continue their monologue. "He will. He won't. He will. He won't." The face frowns over the old jacket, over the swift seam, the head jerks backwards, the face relaxes, the brow smoothes out, the rind of a former thought dissolves and a new idea begins to gather, on the blank open face, the face stiffens again, stiffens and frowns. And the footsteps in the other room are the basis of this thought, of one, then a second, then a third, dissected by the perpetual affirmation and denial, today just as yesterday and the day before, and for months already. Only the floor yields, creaks dully, the shoes do not strike it, for he steps on to his whole foot, stretching his leg like a sportsman, but only out of habit, it is just the tread of a heavy body now. Somewhere a steamer whistles, then sounds its horn, and a donkey answers from somewhere in the upper town. "It's no use, my dear," she murmurs and moves her needle faster. "It's no use at all, believe me." The bowl in the cupboard clinks among the crockery. He appears at the open door of the little room. His grey eyes twinkle among the cushions of his lids, under his high nose and long moustache his mouth twists slightly, scorning her doubt. "It's all right." He forms the words with effort in a bass murmur that is too deep. "Everything, for God's sake." He softens his voice casually: "everything's all right, everything." "Oh, be off with you!" But she lowers her head immediately, embarrased by her heartlessness. She applies herself to her mending with renewed attention. He considered the conversation over. He bends over the collection of sticks in the jar in the corner. Carefully he chooses the ebony one with the ivory spaniel's head, a present from his father-in-law in New Zealand, a stick for the square and quay, a critic of two-legged pastimes and observer of distant, lingering ships. He slowly ex­ tracts the treasured object with two fingers, examines it short-sightedly and puts it straight back in its place; he was afraid of being mistaken. Coming into the room, he looks back on those days, absently. He goes over to the window. "I'll see whether there's any fish," he grunts, and his voice sounds as though it is coming from a deep, resonant tank. "Go on, who's stopping you," said his wife. "He has to justify himself everytime," she thought. She knew his ways by heart. In any case she was not interested in where he was going or where he had come from. He had grown old already, in his fifty seventh year; he could only hide the occa­ sional glass now. "Call in at the cobbler's. Is he ever going to mend those shoes of mine!" "Yes, yes, all right... who's thinking about shoes..."
He stopped a step in front of the window. And she blinked, feeling him nearby. He never attributed great significance to anything, never showed any curiosity, that is he preserved the dignity of a man of character. And he had a face that tended to scorn. And now he is looking round the sunny part of the square with appar­ ent indifference, past the pump, the part of the quay immediately under the window, the peasant boat. Two sailors in shabby blue linen suits slowly disembark, carry bluish sand in troughs and throw it with identical move­ ments of their backs on to the pile behind the harbour wall. A small boy and girl had interrupted their chase, and stopped by the boat, to watch the work, out of breath, their shoulders hunched; they stand for a while: what could they do here now? And a little further on a yellow dog bends down very carefully, stretches his head over the quayside, staring into the unknown blue. Further down in the harbour a little steamer was moping in the haze; the port was still resting its war wounds, it had not yet opened its arms to the distant world. And more and more people were coming out on to the quay. They swarmed beneath the brightly lit faces of the houses and the walls of the old palace. He shuts his eyes. He rocks as though he is about to fall over backwards. He opens his eyes and fixes them, without turning his head, on the picture over the japanese bamboo table, immediately next to the window. A boy with a long face and wavy hair was watching him solemnly, thoughtfully, through grey eyes, pursing his lips self-confidently, with a slight trace ofbitterness. He always used to confront him bravely: "I have my own life, and you, my son, must live yours, but - not one without the other!" And now he says to himself, rubbing his nose as a playful wave comes over his face: "you couldn't upset an old reveller like me, ha ha hai"
His son was interested in music, composed, played the cello and studied architecture. "He used to imagine great halls where thousands would listen and watch in silent communal pleasure. He was, ah yes, he was..." He blows his nose loudly, stares out of the window. "How can it all vanish! All those thoughts, all that will, his eyes? So much! How can it all stop?" And the eyes from the picture reassure him, with that playful accompa­ niment: "I'm alive. I'll come." And the old man smiles: "You couldn't upset me, could you, eh?" "And why should you upset me? It's all part of life!" ,,What did you say?" asks his wife. "Nothing, eh? You've begun to talk to yourself." And her voice trembled strangely. "Not to worry. Isn't that right?" He winks towards the picture. And the eyes from the picture reassure him again: "I'm alive. I'll come." "I'll stay out a little while. I'll go as far as the council," he says calmly. "They're going to build a big factory down in the bay." His wife says nothing. He glances at the sticks in the corner, turns something in front of himself with both hands, and swings away, stretching his arms and legs in a casually sportsman-like manner. "Good bye then, old lady," he said. "Go on, go on, young man." She pursed her lips mockingly. She too enjoyed life thoughtfully, she was waiting for some great opportunity, for some big parade, with immeasurably decorated rooms and inexhaustible time when she would make her captiviating, voluptuous entrance, but without extravagant attire - strik­ ing in herself alone. The harbour is coming to life. Little boats tie up, cast off, or bob lazily by the wall. Life is waking up slowly but irresistibly. The sunlight has hardened on the row of old houses and ruins as though it were going to stay there as bright as this forever, to seal the peace. And the ruins, whole blocks, the shattered quay, the sunken ships, even the little fisher boats, are resting after great exertion. "That's civilisation for you! That's culture!" he said out of habit as he walked. Even steps, with a definite objective. A long face, with deep lines, like some successful actor's, motionless. Considerable knowledge -of women, families, property. It had passed. It had all passed. And this too had passed. There was no more force. There were no aeroplanes in the sky. No torpedo boats or destroyers in the port. There were no dangerous green uniforms. It had passed, it had all passed. "You see the kind of things they do..."
"Grandad's talking to himself," said a boy to the air. "Yes," he said, "l am." There, people pass by, children go to school, boys stroll and talk of things of the present. The present, the present! These bodies, even their clothes, are from those days. Is it possible that he is not here? His friends greeted the old man. Boys who had been in his class, rowed with him, swum, played in the band. They came to say that someone had said, that some third person had said that they had seen him in Italy. Someone had seen some of our !ads in Germany. No-one had witnessed his death. They had seen him last during the Fifth Offensive. He was rid­ ing on a worn-out horse, wrapped in a blanket, bare-foot (he had given his boots to a foot-soldier), all swollen from a kidney disease, which had grown worse during the interminable marching, with no food. "Forward, !ads, don't be afraid!" he had been shouting. He did not complain. They retreated and broke through the enemy lines. Days went by, and nights. And suddenly he was lost from sight. "He was the sort who'd crawl off somewhere into the undergrowth to die alone, so as not to be a burden to his comrades" he thought. And the idea flattered him. "He will have sacrificed himself for the others," he said. He started as a young couple passed by. „Ne're going walking, then, are we, eh?" ,,What can you do, grandpa," said the boy good-naturedly. "Carry on, carry on, I've got nothing against it. Go on, young man. Forward!"